The Kents Cavern specimen was thought to be about 31,000 years old, but re-dating shows it is actually between 37,000 and 40,000 years old. A new examination of the fragment along with DNA analysis could sort this out. 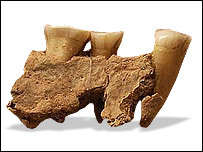 The fragment of maxilla (upper jaw) containing three teeth was unearthed in Kents Cavern, Torquay, in 1927 during an excavation by the Torquay Natural History Society. 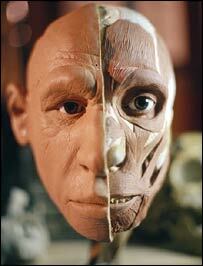 Sir Arthur Keith, who was then Britain's leading anatomist, identified the specimen - known as Kents Cavern 4 - as that of a modern human (Homo sapiens). It has by and large been accepted as such ever since. The real significance of Kents Cavern 4 was not recognised until the 1980s, when radiocarbon dating revealed its age to be 31,000 years old. However, the recent discovery that the bone had been strengthened with paper glue (probably soon after it was excavated) placed that radiocarbon age in doubt. Now, Roger Jacobi of the British Museum and Tom Higham of the Oxford Radiocarbon Accelerator Unit have obtained new radiocarbon dates for animal bones in cave sediments just above and just below where the jaw fragment was found. These indicate that the layer the maxilla is from dates to between 37,000 and 40,000 years ago. Of the handful of modern humans older than 28,000 years known from Europe, only the now questioned Kents Cavern 4 and the 34-36,000-year-old remains from Pestera cu Oase in Romania have been directly dated. Direct dating gives an absolute age for the find and the rocks in which it is buried. The alternative, relative dating, only says whether a find is older or younger than something else. If the Torquay discovery is from Homo sapiens, says Dr Higham, "it would be the oldest directly dated modern human in Europe". "The [relative] re-dating of this specimen puts it at the very dawn of the arrival of modern humans in Europe. So early, in fact, that it makes us wonder if it is from a modern human or from a Neanderthal," he told the BBC News website. Tooth samples will also be sent to the Max Planck Institute in Leipzig, Germany, where researchers will carry out DNA analysis. In either case, the specimen will occupy an important place in the European prehistoric record. 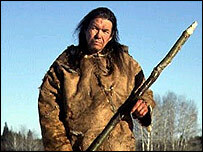 If the jawbone is Neanderthal, it will be the first "classic" Neanderthal confirmed in mainland Britain. Early Neanderthal teeth dating to about 200,000 years ago have been found at Pontnewydd, Wales. But if Kents Cavern 4 is found to come from an early modern human, or Cro-Magnon, the implications would be even more astounding. "People have been arguing that [modern humans] may have been in eastern Europe early but they certainly weren't in western Europe," Professor Stringer told the BBC News website. "If Kents Cavern does turn out to be a modern human, it would mean some of them at least had come across very early. "That would mean that in Britain and in western Europe, there was at least 10,000 years of overlap between Neanderthals and modern humans." The pattern of bones and artefacts found at Kents Cavern also provides clues to what was going on there. "The cave is being used on a massive scale by spotted hyenas as a den. There are huge numbers of gnawed bones and layers of coprolites [droppings]. So the hyenas are being interrupted by humans coming in to spend the night and have a meal. I doubt they're really living in the cave," said Dr Jacobi. The maxilla is associated with stone tools, but the researchers cannot yet determine the type of tool technology to which they belong.